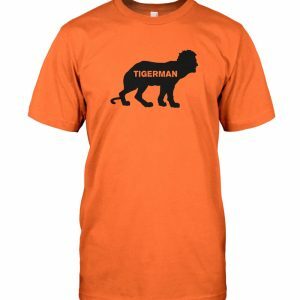 Not so long ago in a basement not that far away, in the deepest darkest depths of New Jersey, Tigerman was born. The band is a highly improvised, mostly instrumental product of the diverse music backgrounds of its members who met while studying music at William Paterson University. Consisting of Adam Carelli on Alto and Tenor Sax. Jay Gogel on Keys. Kurt Althoff on Guitar. Joe Stracquatanio on Bass. And Rory Burns on Drums. 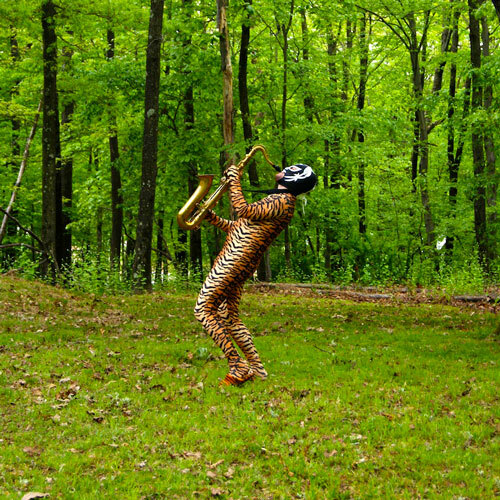 These five musicians possess the musical strength, speed, agility and ferocity of a Tiger in its most primal state. 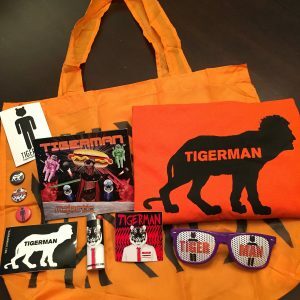 Tigerman’s sound blends elements of funk, jazz, rock and the bizarre into the unique blend of groovy jams and epic aural journeys. 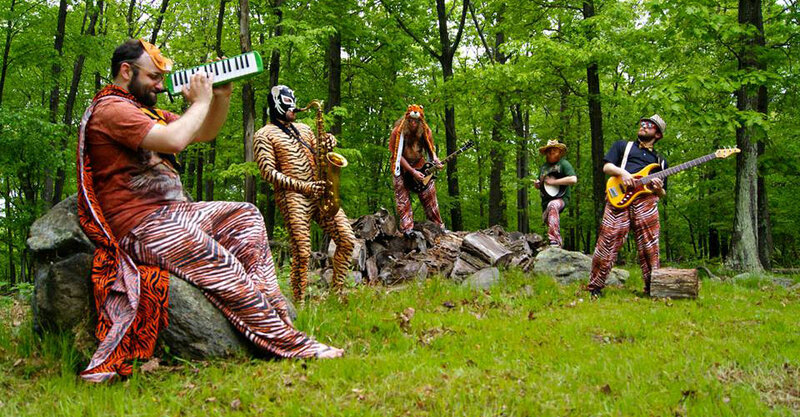 Since their formation in 2011, Tigerman has played many shows across the North East and released several EP’s. Their newest release Majestic is available on CD Baby, iTunes, Spotify & Bandcamp. Since birth, Adam has been an unyielding creative tornado. Drawing, painting, and building things as soon as his hands could grasp at and manipulate the world, he found his true calling when his grandmother began teaching him piano. In 3rd grade he got his first saxophone and it was all over from there. He grew up playing in concert band, jazz band, marching band, and basically any band that wanted some sweet horn action. Attending both William Paterson and Rutgers Universities for music education/classical performance, he eventually switched majors and earned a degree in sound engineering arts. Over the years he has laid down sax tracks for many projects, and been a driving force in NJ bands such as The Creeping Dead Charlies, Consolation Prize, Grandma, The Kreptatka Bar Band, Unexplained Bacon, and of course Tigerman. A live sound engineer in the civilian realm, his headspace is never far from the world of audio. 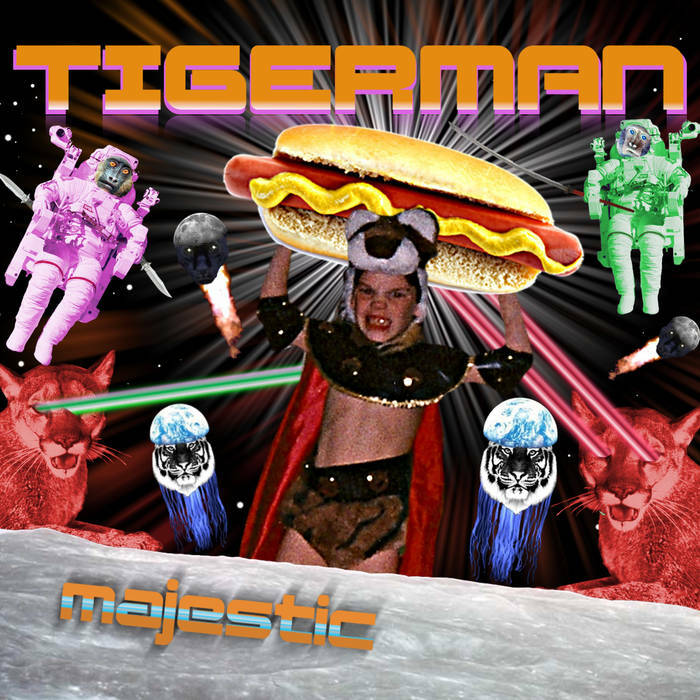 In Tigerman he is the Ambassador of Face Melting on tenor sax, alto sax, MIDI wind synth, and a wee bit on vocals. Always ready to throw back a beer or light up a good time with friends, I dare you to find a human being that this weirdo can’t get along with. Kurt Althoff knew from an early age that he wanted to make music his life. He picked up his first guitar at the age of 9, which began a lifelong love affair with the instrument and the music with which it is associated. From an early age he’d often perform in classical ensembles, rock bands, blues groups, choral ensembles, and improvisational groups. Kurt achieved his Bachelor of Music with an emphasis on Music Management and Classical Guitar from William Patterson University. 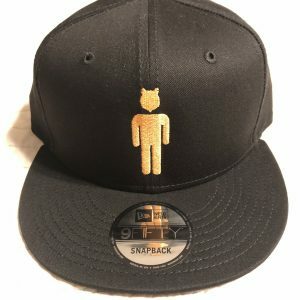 Since college, Mr. Althoff has crafted his own unique niche within the music industry. He possesses a thorough knowledge of the music business as well as the ins and outs of performance, music theory, touring, and stage equipment. Through his career he was worked with World Wide Entertainment Group, Jerry Lembo Entertainment Group, Stanton Street Records, Big3 Records, and many others. In October 2004, Mr. Althoff was the featured tour manager for two-time Rock N Roll Hall of Famer Bernie Worrell’s tour of the East Coast with his band, The Woo Warriors. Currently, Mr. Althoff works maintaining a full schedule teaching guitar and bass to his students at locations such as Encore Music of Clinton, and Privately. Over the past decade and ahalf he has performed all over the north east with many different groups. These include The Kause, Master Jack, Karl Jam, The Wes Santo Band, Nameless Victoms, and of course Tigerman. He has also been known to strike out on his own as a solo performer, having performed at private functions and weddings. Keep your eyes open because this is one busy tiger who is always on the move and looking to pounce! 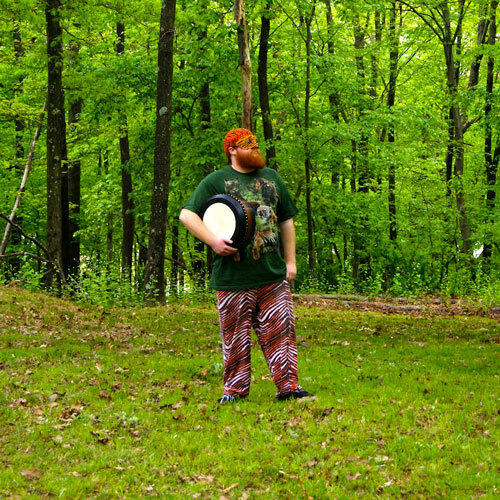 Rory originally hailed from the deep dark woods of Central New York. At an early age, he developed an appreciation of music in many forms. After gaining familiarity with what the musical world had to offer, it was time to choose an instrument for himself. A quick perusal of the various implements available showed only one logical choice, and of course that was the drums. After playing in various school bands, and cutting his teeth on the rigorous coffee house circuit, he chose to relocate to northern NJ to attend William Paterson University. Here he earned a Bachelor of Music with a focus in Audio Engineering. It was during his time here that he met the musicians that would later become Tigerman. After graduation, Rory found himself playing shows with various bands all across New Jersey, New York, and Pennsylvania. These included a band called Grandma that laid the spiritual foundation for what would later become the force of nature known as Tigerman. You can now catch him taking care of the percussive duties in Tigerman, as well as his punk outfit Lakeside Drive and Irish bar band Danny and the Boys. Never one to settle for a single sound or musical style, Rory is always looking to the horizon for new influences and ideas. Joe was born and raised 30 something years ago in a small lake community of Vernon New Jersey called Highland Lakes. He had an interest in music early on but didn’t discover his true passion of the bass until 1994 (His interest in the sound however was actually piqued a few years earlier after hearing Robert Truillo’s funky work with the Infectious Grooves). Joe started with private lessons on the 4 string electric bass learning technique and music theory. His first instructor, Chris Farrelly (student of Dave LaRue) referred to Joe as a “sponge” soaking up everything he could throw at him. Throughout high school, in addition to playing in 2 rock bands and a surf/funk band, Joe also started studying Music Theory which led him to the Upright Bass. His first Theory professor, David Grego, introduced Joe to the upright and shortly after recruited him to the Orchestra. By Senior year Joe was playing Upright Bass in the Orchestra, Chamber Strings, Pit Orchestra, Wind Ensemble, and Guitar in the Jazz Band. After graduating High School in 1999 Joe entered William Paterson University as a Classical Performance Major on the Upright Bass. During his first two years there he developed an interest in the technical side of music making and would go on to change his major to Sound Engineering Arts while still studying Classical Bass with John Thompson of the NJSO. By Senior year Joe was playing in The Baroque Orchestra of Boonton, The Orchestra at William Paterson, as well as many small ensembles and pit orchestras. During his time at WPU Joe continued to work on his guitar, harmonica, and song writing skills and also met the future members of a few of his bands. After graduating WPU in 2004 Joe took the position of Monitor Engineer/Guitar Tech for the legendary Jazz Fusion group Spyro Gyra. Here he gained valuable live sound experience and absorbed a ton of experience watching a top notch band performing night after night. It was during this time Joe started jamming on guitar with some former WPU classmates which would turn into the jam band Grandma. Grandma didn’t last very long due to a couple members leaving to pursue other opportunities but the remaining members tried to revive her a few times to no avail. Joe would eventually leave Spyro and enter the corporate AV world to free up weekends for his true passion, playing music. Around this time Joe joined Kurt and Rory’s band The Kause on bass. After a couple years the singer left the band and wasn’t able to be replaced. Joe briefly joined a cover band, Master Jack, on bass with Kurt but left due to lack of interest. After a brief period of being bandless Joe and a close friend, Carmen, formed the alternative punk band Lakeside Drive and recruited Rory to play the drums. 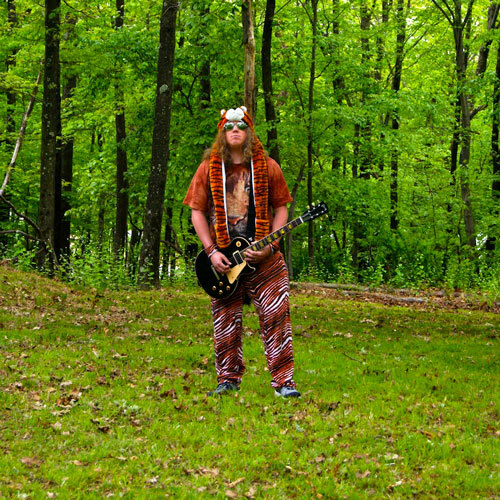 During this time the urge for Grandma style jamming remained and after gathering/meshing remaining Grandma and Kause members with the addition of Jay, Tigerman was born. In addition to laying down the low end in Tigerman, fronting Lakeside Drive on vocals and guitar, Joe also plays Mandolin and Harmonica in the Irish bar band, Danny and the Boys with Rory and Jay. Jay “Ah Brah” Gogel was a little late to the party when he discovered his knack and love for music. He grew up watching his father playing the piano, but did not pick up an instrument until his first year of high school when he chose to play the tuba in the marching band as a fruitless effort to impress a girl. Discovering that music came natural to him, within months he got his first bass guitar, and taught himself to play the piano through many grueling hours of denial and error. He began writing his own musical compositions, joined the choir and drama program and when it came time for college, he went on to study music education and composition at William Paterson University. 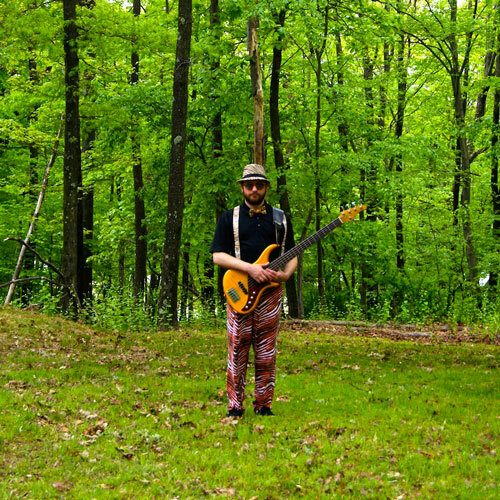 Over the years, Jay has played bass guitar, accordion, and keys with many NJ bands such as Easyfold, Sol Theory, HURT Ninjas and Echo Location. In addition to Tigerman, he is currently an active member of Lakeside Drive and the Irish bar band Danny & the Boys. 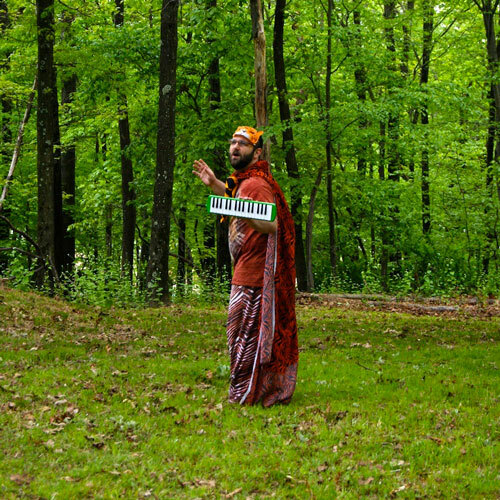 In Tigerman, Jay is the pilot of the self-proclaimed “Command Center,” playing keyboards, triggering samples, and backing vocals. He also coordinates the visuals and projection which play behind the band during live performances. When Jay isn’t playing music, you can find him eating cereal, staring at his magnet collection, and laughing about the absurd journey of life with friends.